As a renowned theologian and author, Richard Foster is a strong but gentle voice on a variety of matters. As a Quaker, he brings a viewpoint that seems almost outside of the mainstream conversations on practical theology and spirituality, but it is not a voice that is misguided, simply one that does not seem to be within the normal scope of conservative Baptist life. This is not a mark against him in any way, but merely an observation that his voice and perspective seem almost distant to the ins and outs of Baptist life for many. He wrote this book with the seeming intention to bring seemingly disparate practices of faith together again, to tear down barriers between more than denominations, but to overlook denominations entirely and instead to focus on the essence of the different types of Christian practice. He is like a wise desert sage whose teaching and writing carry the authority of experience, and the fresh perspective of someone not entangled in the usual matters. Whether this is the view others take of Richard Foster seems hardly to matter, because this seemed to be my impression of teaching this book to a class of very conservative, mostly Southern, Baptists. Whether Foster’s faith as a Quaker was the defining factor, or simply him being someone the class was not familiar with, he was a voice that was warm and inviting for everyone. I first became acquainted with Richard Foster in college as he was a collaborator on a devotional we used in a small group, but as the devotional was primarily a collection of writings from great men and women of faith, his influence was diminished. The result was that for over a decade, Richard Foster was to me, “That guy who helped put that one devotional together.” I never had read any other of his books until this one. This was my loss. In reading this book I was stretched and affirmed in a variety of ways, and by the time I had read this book I had become well acquainted with his reputation. Never first-hand, but I nevertheless knew that I was excited to be finally reading one of his books. Though I came late to Foster’s writing, I do not foresee leaving his writing behind anytime in the future. He managed in this unassuming book to articulate in a simple manner much of the stretching that I had to do in my first year or two of seminary. I have come to learn over the last few years that my Christian background has been skewed far more Fundamentalist than I realized. This resulted in a very close-minded view of other Christian traditions, and a downright disdain for anything that smacked of “Catholic”. As a result I was not open to other practices and traditions outside my own. Foster’s book is an outstanding antidote to that flawed way of thinking. Foster has taken all of the various threads of Christian practice and tradition and divided them into what he refers to as streams which together form and flow into the main river of Christianity. These six streams are Contemplative, Holiness, Charismatic, Social Justice, Evangelical, and Incarnational. Together these streams encompass all (or at least the majority) of Christian denominations, and more so, in a way in which is not strictly bound to the often superficial or misunderstood denominational terms. In considering each of these streams in turn I was able to differentiate the various facets of my faith and practice and was able to see that there were many areas in which I was very restricted and close minded. Embracing these streams one by one, and trying to value each of them was a very beneficial and profound experience. The Contemplative stream has been the stream that I have embraced most in the last year or so. It is one that resonates deeply within and has given me a great peace and inner grounding within Christ and routine prayer. I have found benefit in adding structure and routine to my prayers, and over the summer I embarked on a journey of trying to pray the daily office. I succeed in making time about half the time, but that is a big step for me and a really enjoyable time. I find that I really want to keep daily hours of prayer, but the challenge is in the varied schedule in which I have, so I don’t sweat it for the most part. Instead I keep trying to keep my daily appointments throughout the day, but not in a way that becomes legalistic. The Holiness stream is one with which I still have room for improvement. I find that there are many times throughout the day when I need to be more mindful of my continued need to be Holy. This is a challenge at times, and is something I used to be good at, but very legalistic. Now I am trying to not be legalistic, but still seeking to be Holy. I still have a lot of progress to make in this regard. Reading and studying the charismatic stream has made me far more aware of the Holy Spirit at work in my life. I am now addressing prayers to the Holy Spirit, and embracing the Spirt’s leading in a more fluid and open way. Even simply giving credit to the Holy Spirit is something that I am doing more. This wasn’t a particularly hard stream for me to grow in, but one that might be challenging depending on the context of what type of church I serve in. The Social Justice stream has been a stream in which I have done a lot of growing over the last few years. Being at Truett certainly has gotten me far more involved and caring about this stream of Christianity. I would not say that I was not a compassionate, but I did take a spiritual gifts test several years ago, and compassion/empathy was one of my lowest areas. However, for Christmas I received a copy of Common Prayer: A Liturgy for Ordinary Radicals, and after having prayed through that most days I have become far more aware of the Social Justice stream. This section then of Streams of Living Water, built upon that experience, and the experience of being in Truett around so many caring, involved, and compassionate people. As a result I am far more sensitive and aware of these issues, but I know I still have much room to grow. The Evangelical stream is the one I am most experienced in, but even so, to consider its roots and the core tenants, was a good process. I felt grounded, but also realized that after having spent time in and with the other streams, I consider my self less Evangelical (strictly speaking). Though this is more having to do with the ways in which that term gets used in America, more than what Foster had to say. In considering the stream from Foster’s perspective, I am still rather Evangelical, and will, as a Baptist, always be so, but now I don’t simply want to be only experienced in the Evangelical stream. The last stream, Incarnational, is one that I first became exposed to in my reading and experiences in Truett. Dallas Willard and T. B. Maston both write on the subject, and though both of them might not be considered Incarnational, they were engaged in that discussion. 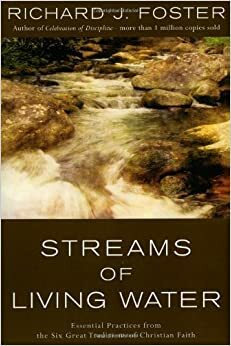 As a result, this was not my first exposure to this type of spiritual practice, but in reading Foster’s book I was struck by the inherent need for this stream to receive more emphasis within the Baptist tradition. It was an excellent building block in my own faith that skillfully fleshed out thoughts that I had had regarding art and vocation and many other things. This was a very good section. Over all this was a wonderful book. I am glad that I read it, and very glad that I also had the opportunity to teach through it. The book and study seem to be an excellent thing for Baptists, particularly those who, like me, have had a close-minded faith for a long time. This opened my eyes wider in many places, and gave me an excellent tool to use in the lives of others. I would give this book (and study) a 10 out of 10. ‹ Get out of the Boat? Are you Crazy? !